…a Vital Piece of Your Health Care Puzzle. 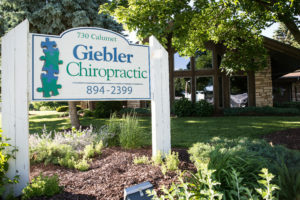 Giebler Chiropractic…a Vital Piece of Your Health Care Puzzle. Chiropractic is about helping people live healthier, fuller lives. While typically thought of as “bone doctors”, chiropractors actually focus on the nervous system by adjusting the vertebral column in order to improve the function of the nervous system. Rather than “chase” the symptoms that show up when you’re not feeling well, Chiropractors address and improve your body’s own healing ability. The practice of chiropractic focuses on the relationship between structure (primarily of the spine) and function (as coordinated by the nervous system) and how that relationship affects the preservation and restoration of health. In addition, Doctors of Chiropractic recognize the value and responsibility of working in cooperation with other health care practitioners when in the best interest of the patient. If we can help you, we’ll help…And if we can’t, we’ll get you someplace that can! If you need help getting your Health back on track…Call Giebler Chiropractic to put the pieces back together! We will work with you to improve your TOTAL HEALTH! Feel better and live pain free with the help of Chiropractic Care! Copyright © 2019 · Giebler Chiropractic. All Rights Reserved.